Point Hicks or Tolywiarar (formerly called Cape Everard), is a coastal headland in the East Gippsland region of Victoria, Australia, located within the Croajingolong National Park. The point is marked by the Point Hicks Lighthouse that faces the Tasman Sea. The traditional custodians of the land surrounding Point Hicks are the Australian Aboriginal Bidhawal and Gunaikurnai peoples who called the point Tolywiarar. In April 1770 it became the first land on the east coast of Australia to be sighted by Europeans, when HMS Endeavour reached the continent during the first voyage of James Cook to the Pacific. There is no land feature at Cook's coordinates of 38°0'S and 148°53'E, a point which lies several miles out to sea and under 50 fathoms of water. It has been recently claimed, without evidence, that Captain Cook may have invented Point Hicks so that he could conceal Bass Strait and the insularity of Tasmania; that the Admiralty had issued its 'usual instructions' to hide strategically important discoveries that could become security risks, such as off-shore islands from which operations could be mounted by a hostile power, at a time of intense Anglo-French rivalry; that, consequently, in his journal Cook disguised his discovery with a riddle; and on his chart he drew a curtain across the truncated channel by sketching a false coastline down to an invented Point Hicks; and that Cook's 'ploy' worked and Tasmania's insularity was suppressed for three more decades. When news of the 1798 discovery of Bass Strait reached Europe, the French government despatched a reconnaissance expedition commanded by Nicolas Baudin. This prompted Governor King to send two vessels from Sydney to the island to establish a garrison at Hobart. In 1970 the Victorian government changed the name of the nearby coastal promontory of Cape Everard to 'Point Hicks'. It lies on dry land, about 22 nautical miles (41 km) northeast of Cook's phantom Point Hicks, where it preserves the story of Cook's first landfall in Australia. The plaque on the landward side of the obelisk at Point Hicks, Victoria, Australia. The sighting took place at first light  on Thursday 20 April 1770 by Lieutenant Zachary Hicks aboard Captain James Cook's exploration vessel Endeavour. This was the first of Cook's three voyages to the Pacific, and the sighting came after 19 days' westward sailing following Endeavour leaving New Zealand on its homeward journey. Cook recorded in his ship's Journal that it was Hicks who first saw land, and that later that day he (Cook) named a far-off point after Hicks: "I have named it Point Hicks, because Lieutenant Hicks was the first who discover'd this Land." This was confirmed by Aaron Arrowsmith's 1798 Chart of the Pacific Ocean, clearly showing Cook's Point Hicks. Hickes did not survive the return voyage, dying soon after Endeavour left the Cape of Good Hope. Cook estimated the coordinates of his Point Hicks (from a great distance) to be located at 38°0′S 148°53′E﻿ / ﻿38.000°S 148.883°E﻿ / -38.000; 148.883, a location in the sea over 60 km to the South West. Though measuring longitude in Cook's time was problematic due to the paucity of reliable marine chronometers, Cook and his astronomer's measurements of latitude were usually very accurate. Nevertheless, the latitude of 38 degrees S placed the point more than 20 km out to sea from the East-West running coastline. It is likely that the reckoning was an error, that a cloudbank was mistaken for land, and that the true location of landfall by Endeavour lies somewhat to the East of Cape Everard. George Bass sailed past the area at the end of 1797, in an open whale-boat and was unable to identify the point. Although Matthew Flinders sailed past the area in 1798–99 and again in 1802–03, the coastal area near Point Hicks was always out of Flinders’ visual range. Therefore, it did not appear on any of Matthew Flinders' published charts. The name Point Hicks was still being used on maps up until 1840, before being replaced and renamed Cape Everard. The first use of the new name has been attributed to hydrographer John Lort Stokes who surveyed the coast in the Beagle in 1843. It is presumed he named it after fellow naval officer James Everard Home. Stokes' maps don't record the name, but many secondary sources attribute its introduction to him. The first known chart showing Cape Everard was published by surveyor George Douglas Smythe, made in 1852 and published in 1853. If he coined the name, then according to one theory he may have been referring to William Everard, commissioner of crown lands (though no record of that Everard has been found). The name Cape Everard was then adopted from 1853 up until the early 1900s, until more historical information became readily available. "Lieutenant James Cook, R.N. Of the Endeavour, First Sighted Australia Near This Point, Which He Named Point Hicks After Lieutenant Zachary Hicks Who First Saw the Land. April 19th (Ship's Log Date). April 20th (Calendar Date). 1770." In the 1930s, the Australian business man and philanthropist Russell Grimwade commissioned stone to be quarried from Cape Everard and shipped to Great Ayton in Yorkshire. It was used to create a replica monument with an identical plaque placed at the site of the Cook family home, following Grimwade having the home dismantled and removed to Fitzroy Gardens, Melbourne in 1934. Cook's name, Point Hicks, was officially established as the name of the cape as part of the bicentenary of Cook's 1770 voyage. Victorian Premier Henry Bolte proclaimed the new name in a ceremony at the point on 20 April 1970. Point Hicks has a mild oceanic climate (Cfb) with pleasant summers and cool damp winters. ^ a b "Point Hicks: 17439". Vicnames. Government of Victoria. 2 May 1966. Retrieved 9 January 2014. ^ a b c d Haldane, Robert (2001). "A Beacon on the Wilderness Coast: The Story of Point Hicks (Cape Everard)". Gippsland Heritage Journal. Retrieved 27 February 2015. ^ "Point Hicks Marine National Park". Parks Victoria. Government of Victoria. Retrieved 10 January 2014. ^ Beaglehole, J.C. (1968). Journals vol.I. Cambridge: Hakluyt Society. p. 299. ISBN 0851157440. ^ a b Cook, James (1 May 2005). Wharton, W. J. L (ed.). Captain Cook's Journal During His First Voyage Round the World Made in H. M. Bark "Endeavour", 1768–71 (e-book). Project Gutenberg. ^ Flinders, Matthew (17 July 2004). A Voyage to Terra Australis (e-book). Volume I. Project Gutenberg. ^ Lipscombe, Trevor (August 2014). "Hydrographers v Historians — the truth about Point Hicks" (PDF). Map Matters. Australasian Hydrographic Society (24): 4–8. Retrieved 27 February 2015. ^ "COOK'S VOYAGE". The Argus. Melbourne: National Library of Australia. 6 November 1924. p. 17. Retrieved 27 September 2013. ^ "Climate statistics for Point Hicks". Bureau of Meteorology. Retrieved 1 February 2017. Point Danger is a headland, located at Coolangatta on the southern end of the Gold Coast on the east coast of Australia. Separated by Snapper Rocks and Rainbow Bay to the west, with Duranbah Beach and the Tweed River mouth to the south, present-day Point Danger has also indicated the border between New South Wales and Queensland, Australia, since 1863. Stewart Island, officially named Stewart Island/Rakiura,, is the third-largest island of New Zealand. It lies 30 kilometres (19 mi) south of the South Island, across the Foveaux Strait. Its permanent population is 381 people as of the 2013 census, most of whom live in the settlement of Oban on the eastern side of the island. The Bicentenary of James Cook in Australia was commemorated in Australia in 1970. 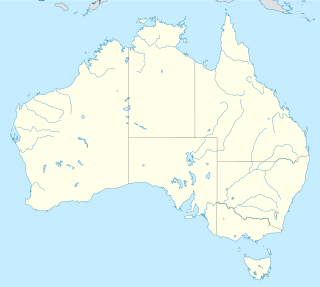 The British explorer Lieutenant James Cook sailed and charted the East Coast of Australia in 1770, and claimed the Eastern Seabord of the Continent for the British Crown. This is not considered the official bicentenary of Australia, but rather the mapping of the Eastern coastline.